If you would like to change your Black/Dark hair into other shades of brown or burgundy, you could choose Silk Touch. Silk Touch comes in 8 exciting colours. Silk Touch ingeniously designed easy-to-use comb-in applicator is fun to use. For centuries, ginseng extract has been trusted to renew vitality in hair. It nourishes, revitalizes and brings back glossy, healthy sheen and helps provide longer lasting color. This ingredient is a vital part of Bigen™ Silk Touch, the newest product from the world-famous Bigen™'s line of hair color-related cosmetics. Besides its ginseng component, what sets this product apart is that it contains silk protein, which gives hair silk-like shine and feel. It has a longer-lasting color, a more soothing floral scent and a perfect-gray coverage. The product is specially formulated for oriental hair. 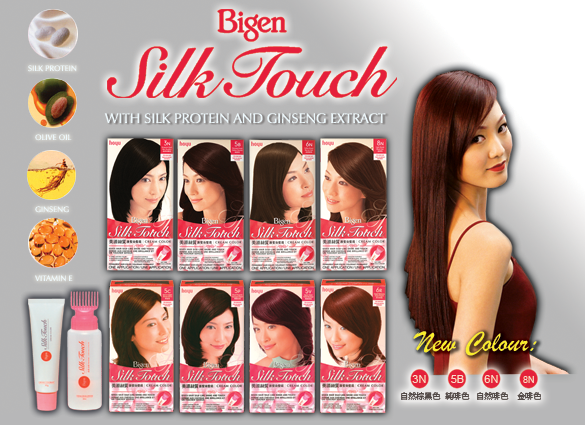 What's more, Bigen™ Silk Touch is gentle on the scalp. Once applied, those tiny color pigments penetrate deeply into the hair shafts. Upon drying, the cuticles naturally close and absorb the new color. Actual colors may vary from the color on your screen due to device settings & display/monitor color restrictions. See detailed instructions in package box. Interested? Get Bigen™ Hair Color today! Copyright © 2019 www.bigen.ca. All Rights Reserved.